Jack Rady and Family. Local Family Owned Austin Home Buyers. Zit Buys Homes are family-owned and locally-operated professional home buyers in greater Austin, TX. We Buy Houses Anywhere In Travis County, Williamson County, Hays County, Bastrop County, and Burnet County. If you want to sell your Austin house fast… we’re ready to give you a fair all-cash offer today. You never have to make repairs and we pay all the closing costs for you! Check Out How Our Process Works. Zit Buys Homes is a local Austin home buying company with a 5-star reputation that will take the time to understand your needs, your situation, and what matters most to you. Are you at risk of losing your home to foreclosure? Can’t keep up with the maintenance and repairs? Need to relocate quickly? Do you just want to avoid the entire hassle of selling your house the traditional way? Or do you just need some help understanding your options? Then get in touch with Zit Buys Homes today. We understand that selling your home can be stressful and difficult when trying to do it yourself. With Zit Buys Homes, there is no need for real estate agents, mortgage loan appraisals, costly repairs or any of the hassle that comes with selling your house the traditional way. We make it easy to sell your house fast for cash. See for yourself the difference between Listing Your Property vs Selling To Us. Our family has worked hard over the past several years to establish ourselves as trusted home buyers in Austin, Texas. We take pride in the service we provide to the neighborhoods that we live and work in. We love what we do, and Zit Buys Homes understands the importance of the real estate solutions we provide to homeowners like yourself all over the Austin area. We take our responsibility as being the best real estate consultant in Austin extremely seriously. We will always treat you with the utmost respect, compassion, and courtesy. Zit Buys Homes is accredited by the BBB with an A+ rating. Jack Rady and Zit Buys Homes LLC take a lot of pride in being able to assist so many homeowners who need to sell your Austin house fast… whether it’s as a result of a foreclosure, bankruptcy, divorce, probate, inherited home, behind on payments, a landlord who’s tired of dealing with tenants, or any number of other reasons… we’d love to help you discover all of your options available to be able to sell your house fast and easy today. One way to sell your house fast in Austin is with our “We Buy Houses Austin” program where we’ll make you an all-cash, no-obligation, and no-hassle offer today. There are many companies that buy houses in Austin you could choose from. However, we are cash home buyers in Austin TX who listen to your needs and always place your interests ahead of ours. As local Austin home buyers, we understand the importance, sensitivity, and uniqueness of each homeowner’s particular situation. Our goal each and every time is to provide you..the homeowner…the option that benefits you the most! The bottom line is…if you have a house and want to sell it… then we want to buy your home today! We are the premier “I Buy Houses Austin” home buying company. No matter the condition your house may be in, you can sell your Austin area home even if the roof is leaking and the foundation is cracked. We buy houses in Austin, Texas “As-Is”. Selling your home fast for cash with Zit Buys Homes LLC is a simple and hassle-free process.. If you said “yes” to one or more of these questions, Zit Buys Homes can help! We are professional and experienced specialists in solving real estate problems for Austin area homeowners. You deserve to know and understand all of the options available to you. This will allow you to decide on the best course of action for the financial welfare of your future. Don’t let the banks control you if you’re faced with foreclosure or if you have an unwanted property that needs extensive repairs...no matter the situation, we are here to help! 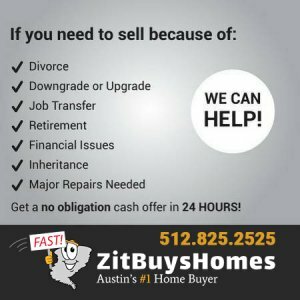 Call Zit Buys Homes Today at (512) 825-2525 or fill in the form below to get your free, no-obligation offer. Your Free CASH Offer Starts Here. Fill out this form to find out how much we can pay for your house! Stop the frustration of your unwanted property. 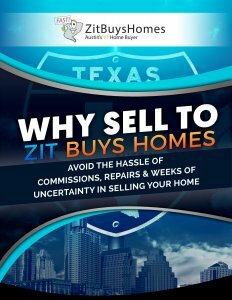 Let Zit Buys Homes LLC buy your Austin, Texas house now, regardless of condition. 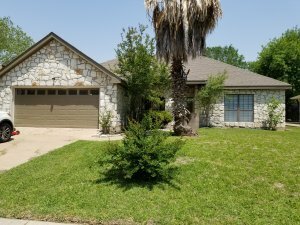 We are Professional Austin Home Buyers who specialize in buying houses for cash in “as-is” condition, we buy ugly houses all over the Austin area. We give homeowners who NEED to sell house fast in Austin and around the central Texas area another option. 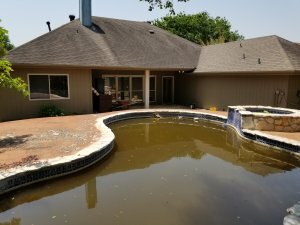 Have you been thinking that “you need to sell my house fast near Austin, TX”? If so, you have found the right place to sell with Zit Buys Homes. 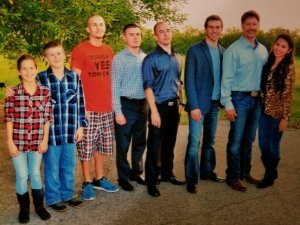 Our family has been buying homes in Austin for over 30 years. Avoiding foreclosure? Facing a divorce? Relocating? Upside down in your mortgage? Tax Liens? Regardless of whether you occupy the property, you’re renting it out, it’s vacant, or maybe the house isn’t even liveable. We assist homeowners who have inherited a property they do not want, own a home they can’t rent out, are behind on mortgage payments, HOA and tax liens are piling up, they need to make repairs but can’t afford to so to sell their home. We even buy homes that have mold, fire damage and even ones that have terrible tenants they are tired of dealing with! We buy houses in the Austin area “AS-IS”. We are experienced and local real estate professionals committed to fulfilling our clients’ needs rapidly while making the process as simple and hassle-free as possible. Many homeowners throughout the Austin, Texas area have sold their homes the easy way with our simple home selling experience. Call 512-825-2525 to sell your home today. 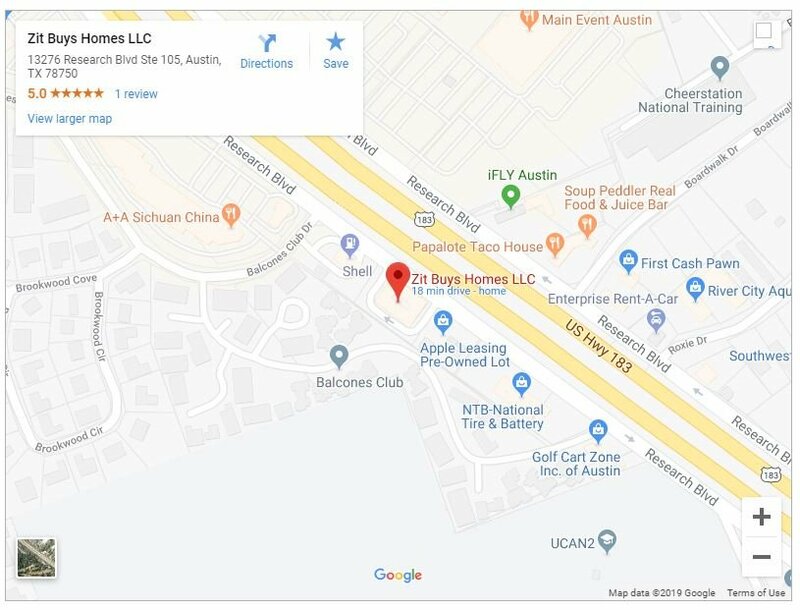 “Zit Buys Homes LLC “, is an Austin, Texas company that buys houses for cash. If you need to sell your Austin, TX house, we want to buy it for cash with an easy, simple and hassle-free process. We understand that selling your home can be a daunting and nerve-racking experience especially when you might need to sell your house quickly due to sudden financial troubles, a pending home foreclosure, an upcoming move, or maybe your house has just been on the market too long. 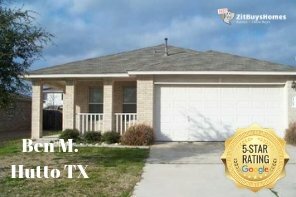 Zit Buys Homes LLC is Austin’s #1 Trusted Cash Home Buyers. We buy houses in Austin and surrounding areas, fast and in “as-is” condition. Our family-owned and locally-operated house buying company exists to provide homeowners, landlords, & heirs a quick, simple and straightforward solution tailored to their situation. You can sell your house to us and stop worrying about the lengthy and difficult home-selling process through a traditional realtor. Whether you are a homeowner who needs to sell quickly or a landlord that is ready to exit the rental business, we are experienced, knowledgeable, and financially able to help. As Austin home buyers, we buy houses and mobile homes with land in any condition in Austin. 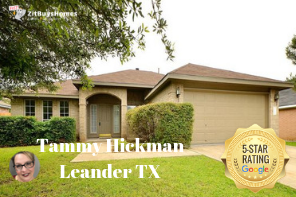 We also buy homes in Round Rock, Pflugerville, Cedar Park, Leander, Georgetown, Bastrop, Manor, Elgin, Hutto and other surrounding areas. To get your free, no-obligation, cash offer on your home you need to sell, fill out the form below or call Jack Rady at 512-825-2525. We are ready to buy your home right now! You don’t have to wait to see if the buyer can get financing or if the appraisal comes in at the price you agreed. We buy houses with cash and don’t have to rely on standard bank financing. The home selling process can be a daunting and nerve-wracking experience which can take several weeks to months to complete. Add in the expenses of selling such as closing costs and agent fees, you may actually lose money selling it the traditional way. No matter what condition your house is in; no matter what situation or timeframe you’re facing… Zit Buys Homes LLC will buy your house! We assist homeowners just like you, who face all kinds of challenges. From foreclosure, behind on payments, divorce, the death of a family member, troublesome rental property, and all kinds of other situations that property owners face. We buy houses in AustinTexas and surrounding areas. When you sell your house fast to us, we will give you a fair cash offer. Maybe you just don’t have the time needed or the money to make the repairs that typically need to be done to get your house ready to place on the market… if that describes you, all you have to do is tell us about the property you want us to buy and sell your house fast for cash. To Zit Buys Homes LLC? What we buy: We buy houses in Austin, Texas in any condition or price range. We specialize in houses that have been inherited, behind on payments, pre-foreclosure, rented, gone through a divorce, sustained fire damage, bad foundations, vacant, and many other situations too. We will buy single-family houses, condos, townhouses, multifamily units, and mobile homes with land. How we can help you: We have successfully completed hundreds of real estate transactions, which means we have the knowledge and resources to solve your real estate problem; no matter what situation or condition of the house. When we say that we want to help you solve your real estate problem, we mean it. We are problem solvers who happen to be real estate investors. you don’t need to clean up and repair the property – you save time, money, and the headaches of hiring a contractor to do the work for you. We take care of all of that for you. No need to empty the house of any unwanted items, etc. We take care of it all. 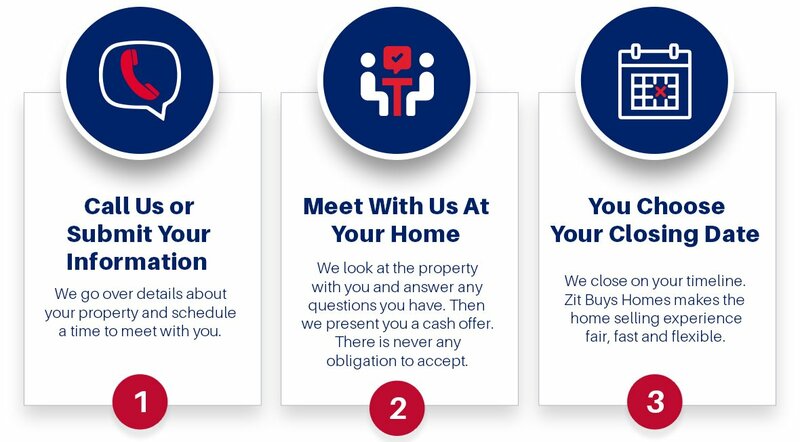 don’t waste time finding an agent who you trust and who can deliver on their promise of selling your house quickly – since we are paying cash for your Austin home, there are no agents to deal with. You get to choose the closing date that fits your needs and situation! you won’t need to sign a contract that binds you to an agent for a certain time frame – we will buy your Austin home on your timeline…no matter if that’s two weeks or two months from now. you do not pay fees, commissions, or closing costs – since we are not listing your home, there are not any fees or commissions associated with selling to Zit Buys Homes. That means more money in your pocket! Family-owned and locally-operated home buyer: Zit Buys Homes is operated by Jack Rady, #1 Trusted Austin Home Buyer. His family has been involved with Austin real estate for over 30 years. Our clients’ interests always come before ours. We tell you all of your options based on your situation even if it means we don’t buy your house. Call Jack Rady today at (512) 825-2525 or fill out one of our contact forms to reach us. We can help you no matter your situation or the condition of your home. Zit Buys Homes has provided homeowners over the years another option to sell their homes in the Austin area. 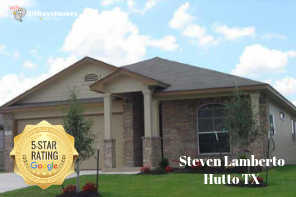 We’ve earned the distinction of being one of Austin’s most trusted home buyers. We love what we do, we understand the importance of the real estate solutions that we provide to each homeowner we work with. Our goal is to help our local communities one house at a time. We do everything we can to ensure your home selling experience is fast, easy and stress-free. The best thing about working with us is that you get to select the timeframe for closing. If you want to sell in 2 weeks, we can make it happen. If you need more time, we can also close on your schedule. You know that you have a cash offer on your home from Austin’s most trusted cash home buyer. Our goal is to get you out from under your property that is causing you stress, while still paying a fair price for your home. Since we buy houses in Austin with cash, we can skip the traditional buying process and close on your schedule. At Zit Buys Homes, we work with you to find a solution. Even if that means selling your house to us may not be your best option. We inform you all of your options which gives you the information you need to make the best decisions for you and your family. There is absolutely no obligation, so you don’t have to do anything if you aren’t completely satisfied with our offer to buy your house in Austin Texas. How far is Austin Texas from the ocean? Austin is approximately 200 miles from the Gulf of Mexico. The City of Austin comprises 272 square miles along the Colorado River in central Texas. Who is the Mayor of Austin, TX? Stephen Ira Adler is an eminent domain and civil rights lawyer who has been the Mayor of Austin, Texas, since January 6, 2015. He is a Democratic politician who strongly advocates for Social innovation, social entrepreneurship, equity and access for everyone. How was Austin, Texas named? What is the population of Austin Texas? As of the U.S. Census Bureau’s July 1, 2017 estimate, Austin, TX had a population of 950,715 up from 790,491 at the 2010 census. The city is the cultural and economic center of the Austin–Round Rock metropolitan statistical area, which had an estimated population of 2,115,827 as of July 1, 2017. What are the neighborhoods that make up Austin, TX?